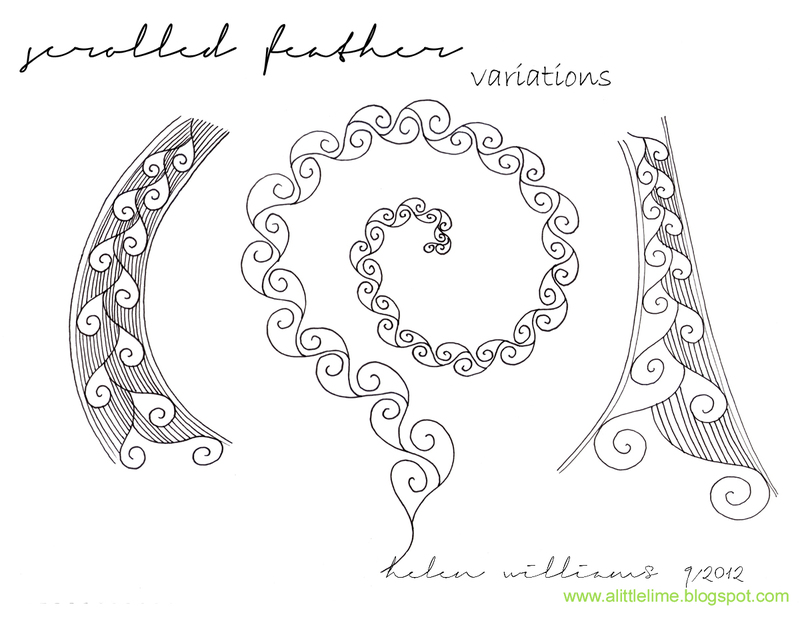 A while back when I did the pattern for Scrolled Feather - I got my daughter to video me demoing - all ready for me to upload to the blog so that you could see how I go about drawing it. Unfortunately my firewire cord, or the video, would not talk to the computer and I couldn't edit it. I still wanted to do it, and today, as it has been miserable and so incredibly cold that even my husband, John didn't want to work outside (an unheard of occurence!) I got him to video me on my little Canon point and shoot camera. Yep. We're a high quality outfit here. Nothing but the best. LOL. Hopefully I don't live to regret it. Anyway, here it is. Take note of the disclaimers at the start - the sound quality is not good (I do not lisp, and I'm sure my voice does not sound like that!) Hopefully you can understand me and my very Aussie accent. I also had a bit of a play with the pattern and came up with a few variations of the theme. Also, along the way, created a new pattern from the basic structure. My head has been so full of ideas this weekend, my fingers are worn out trying to keep up. I've been playing with knyt and have another feather variation on the go. Hopefully tomorrow I will have time to put together another post. I can not thank you enough for sharing the video! It made a world of difference in my approach! Absolutely inspiring! No I have it! 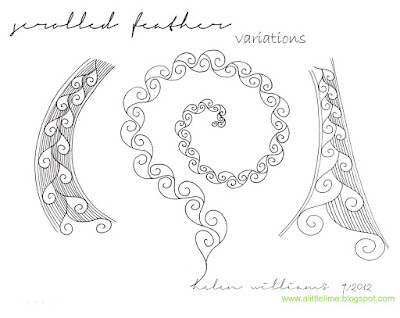 I have tried scrolled feather but without much success. Now it is clear. Thank you (and I love your background "music"). 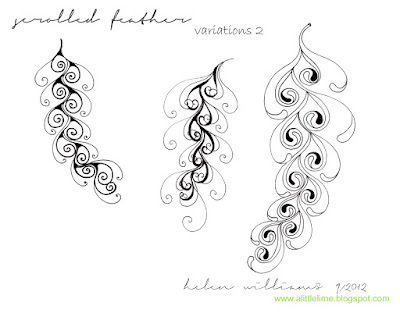 What a beautiful tangle, I must have a go at this one. Thanks for the video instructions. Helen - there is a big blank where the video should be! I can't believe it because I need help with this pattern!!! Looks like I'll have to call in the geek troupe, i.e., my daughter, to see if she can fix the problem. If not, is there anywhere else we can find the video? Hi Jakki, I have just checked and it is working for me & Barbara below must've watched it about an hour after your message. I know that it just showed up with a blank box in the "follow by email" email, but if you are on the site it should be there. Techno-daughter worked her magic! Don't know what she did but I have the video! Once I have cooked, served and cleared up after dinner I will sit and watch!! I'm really looking forward to it! How close are you to Woodend near to Mt Macedon? My brother lives in Woodend and I am hoping to visit him next March....Thank you for all your wonderful work on Zentangle - it is an inspiration! So glad you got it to work, Jakki! HOpe you find it useful :) I am almost as far from Melbourne in the opposite direction from Woodend. It is west of Melbourne, and I am east - around 2.5 hours away. Susiejo- she logged out of Chrome and then restarted it. I have a mac and she said I might need to upgrade Flash - we didn't have to do that....I'd also had a problem with youtube giving me a black box, but I had audio. I hate computers!!! My techno (real genius) son is now in South Korea - he got sick of me asking for help! Techno daughter fortunately still lives close by! 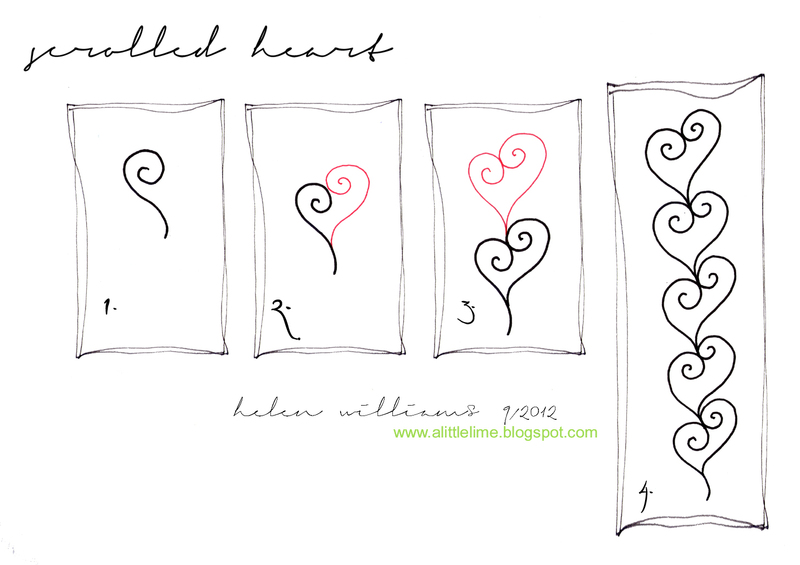 Helen, I am really enjoying your posts - what do you do for a job (besides work on the farm, raise kids, do Zentangle etc). Were/are you an "Artist"? I have finally reached a point in my life where I am comfortable with the fact that I am not an "innate artist." It has taken a long time to stop comparing myself, negatively, to people, such as yourself, who have an inborn gift. Try as I may, I will never be able to accomplish what you can naturally achieve. I can look at your work, and the works of other accomplished Zentangle artists, and I can improve my skills - just as you can develop your talents by practice and lessons - but I can never make myself have an innate artistic talent. Reaching this understanding has, in fact, freed me to be myself and to value my own efforts much more than I was able to in the past. It never fails to amaze me how often a tech will tell you to turn off the computer and wait for a few minutes. lol! Jakki, I work 2 half days a week at a primary school teaching children to cook using seasonal produce that we source either locally or grow in the vegetable garden at school. I love it as eating locally/living sustainably is a subject that I am very passionate about. I am new to working with children though (just this year), and wow, is it exhausting! Up until quitting 5 years ago, I worked as a part-time contractor in the craft industry whilst bringing up my children. I have taught many workshops and written quite a few articles over the years - something that I love doing, the sharing/learning aspect of the art/craft field is so amazing. There's always something new to discover! I have "crafted" my whole life, but it wasn't until I was older when I was exposed to decorative painting through a mother's group and later did a 2 day botanical art course that I discovered I could draw. It was a learned skill for me - I had to learn the mechanics of perspective and how things are put together, it all just clicked. I am so glad you are enjoying the blog, I really appreciate your comments/feedback - such a wonderful feeling to know that others are getting something out of it! Helen, many thanks for the video. I love your work and always look for you first on the challenges. Jakki, thank you for the help on what your daughter did to get the video. It turns out that all I had to do was move from me iPad to my old laptop and it came right up. Thanks to both of you! Thanks so much for the video showing the steps. Very helpful. Beautiful pattern. Thanks so much for struggling to get the vid made. It helped a great deal. I tried the pattern before I started the vid and just couldn't quite make it happen. Your voice was fine and I think a feather pattern should always have a rooster for ambience, don't you??? And now I know how to go about that beautiful feather making. Love all your work and hope I can get a little closer to being so talented as you!! I agree, nothing like a rooster for ambience :) I always forget how noisy they are until I want to video something, it is just background noise to me. Glad the video was helpful. Thank you so much for the video. Loved it and your nonexistent lisp. More, more, more. Thanks for the video. I was struggling with the line work inside. This helped me see what you did. I was not that far off I just started at the wide end and worked to the narrow end. Will try the way that you did it and see which works best for me. Thanks again. Great fun! Thanks Helen! You are a star!! 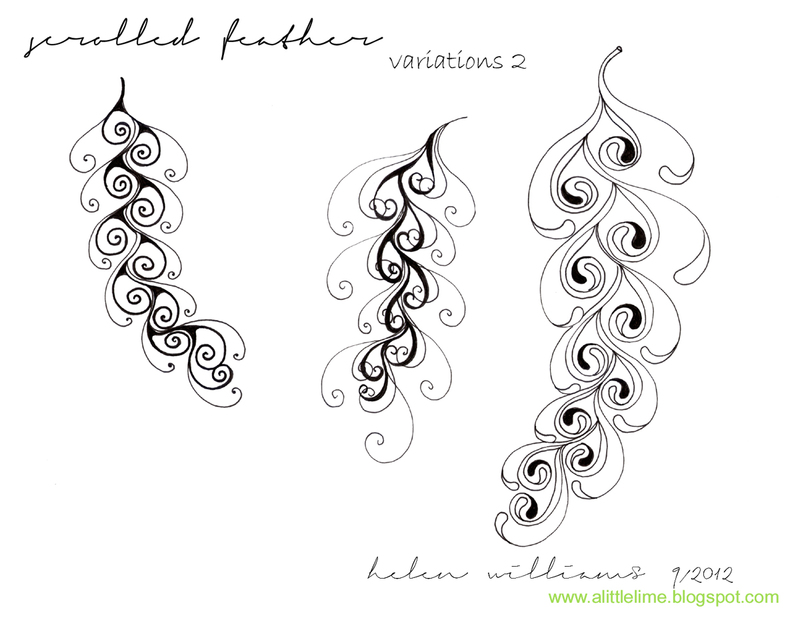 Beautiful tangle, and I love all your variations! You have a beautiful voice and accent - very easy to listen to. Thanks for the video - you made it looks so much easier and fun. Hi Helen... I love the feathers, and I appreciate the video. 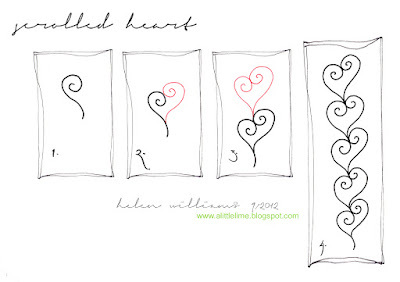 Hi Helen, these patterns are very nice. I can't wait to use them. Have tried this feather many times, but I can't envision the straight lines going down the back of each feather. I must be looking at it wrong??? (hehehe) Can you help?